BANGOR, Maine — The 14-year-old boy had fallen out of a tree and lost consciousness briefly. He had been drinking coffee brandy. When the ambulance crew arrived, he was combative and disoriented. Now, he lay on a stretcher in the emergency department at Penobscot Bay Medical Center in Rockport, breathing irregularly, slipping in and out of consciousness. He had a deep gash on the back of his head and a possible leg fracture, and his blood oxygen levels were dangerously low. Fortunately, the patient was a medical mannequin called into service on Monday to help demonstrate a powerful new technology that lends the resources of Maine’s second-largest trauma center to the smallest and farthest-flung of the state’s community hospitals. 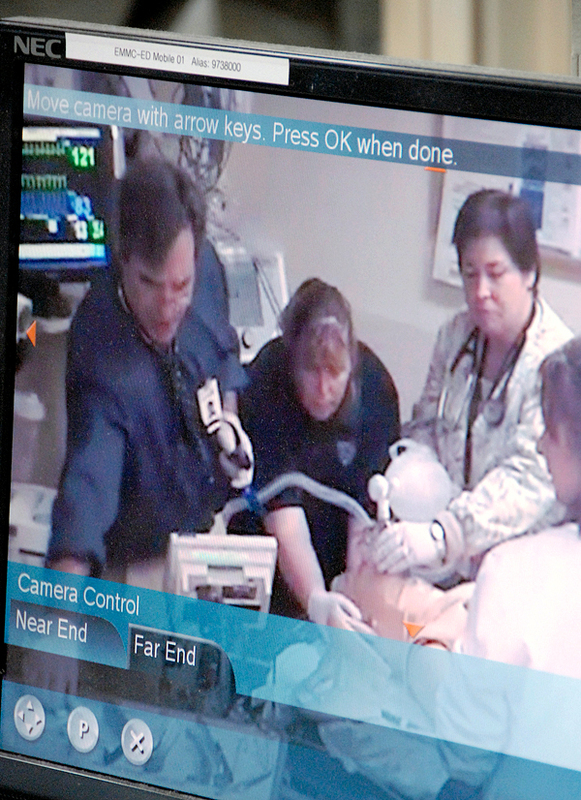 With real-time, high-resolution cameras and monitors linking Eastern Maine Medical Center in Bangor by the Internet to smaller facilities throughout the northern half of the state, trauma specialists from Bangor can provide critical guidance and expertise to clinicians in other busy emergency departments. The expanding “teletrauma” technology is aimed at improving the medical outlook for injured patients and saving money in the health care system. In the Pen Bay emergency room, trauma surgeon Dr. Christopher Michalakes decided to slide a breathing tube down the mannequin-patient’s trachea so artificial breathing could be started. Watching through a camera from the emergency room at EMMC, his colleague Dr. Joan Pellegrini concurred and agreed on which size and model tube to use. “I don’t want to scan him here; I think we ought to call the helicopter,” Michalakes said, concerned that more time spent diagnosing injuries at Pen Bay would delay his patient’s arrival at the higher-level trauma unit at EMMC. The LifeFlight unit was — in theory — already on alert, warming up on the helipad atop the Bangor hospital’s parking garage. “Maine is a uniquely rural state,” said EMMC trauma coordinator and registered nurse Pret Bjorn. That’s why teletrauma makes so much sense here, he said, allowing smaller hospitals to take advantage of the state’s best and most experienced trauma specialists to stabilize severely injured patients before transferring them to a larger facility. In some cases, he said, smaller hospitals may be encouraged to keep patients they ordinarily might transfer. That decision, he said, saved money and time by avoiding the transfer, and also made life easier for the patient and his family by keeping him at the local hospital. 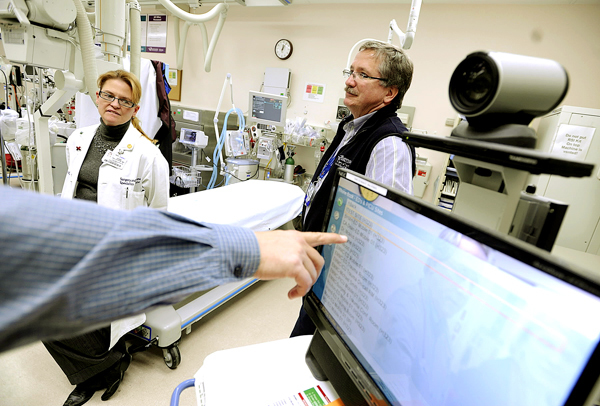 EMMC has been using telemedicine technology for trauma patients since 2005, Bjorn said. So far, 11 area hospitals are linked to EMMC through the Internet-based system. Bjorn said a total of 22 hospitals would be connected before the end of this year. It costs about $5,000 to purchase the equipment to bring a hospital into the system. Among the observers at Monday’s demonstration was Dr. Jamie Watson, a trauma surgeon from Brigham and Women’s Hospital in Boston. Although teletrauma technology has been developed primarily in rural areas, he noted, it is suited to urban areas as well. Watson said he is exploring the costs and logistics of implementing teletrauma services at smaller hospitals in eastern Massachusetts. Brigham and Women’s accepts trauma patients by ambulance or air transfer from throughout eastern Massachusetts, Watson said, but transfer times can be lengthy depending on traffic and weather, costing precious minutes for severely injured patients.